Detail of a Karakalpak aq basqur. The Karakalpaks made a range of tent bands to join, support and decorate the wooden frame of the yurt. The largest was the qızıl basqur, which constrained the base of the yurt roof. This is the widest tent band in the yurt and is made from a mixture of natural goat hair and red sheep's wool. The smallest bands were the short lengths of dizbe, used to tie the qanats and other wooden components of the yurt together. In between were other bands, such as the ishki beldew, and the numerous qızıl qur and aq qur, which together fasten the felt roof parts to the frame. The qızıl qur holds down the front roof section while the aq qur hold down the rear roof section. As well as fulfilling a vital practical role, both the qızıl qur and the aq qur play a secondary role in decorating the interior and the roof of the yurt. In both cases the qur are interlaced with each other to create a lattice effect. Normally three pairs of qızıl qur are interlaced to form the net that decorates the to'r, but in some cases the owners use five pairs of qur to create a more stunning effect. The net is referred to as either shatırash - crossed - or shaxmatlap - in chequerboard order. The most decorative Karakalpak tent bands were the aq basqur and the two pairs of sırtqı and ishki janbaw. Janbaw were always finished along their lower edges with a red and green or red and yellow plaited fringe. 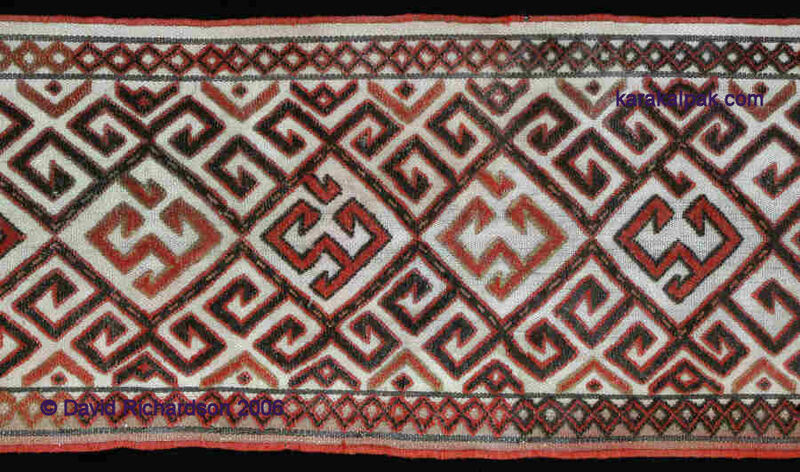 These decorative bands were always woven in so-called combination technique. The thick cotton warps were packed tightly together to create a warp-faced band, two sets of dark goat hair warps being included on each side to make a pair of brown "tramlines" down each side. The bands were decorated with a knotted pile that only partially covered the cotton ground of the tent band. The main colours used were brown, beige, and salmon pink, while secondary colours included black, blue, pistachio green, and golden yellow. In combination technique the knot cannot be tied across adjacent warps, as with a normal all-piled carpet. This is because the tight packing of the warps does not leave sufficient space for normal knotting. Instead the weaver uses just half of the available warps, forming the shed and then tying a knot on only the raised set of warps. The knot is therefore tied across a warp and its neighbour but one. This can only be done using a symmetric knot. After inserting the cotton weft the shed is changed and knots can be tied on the other set of warps. The two rows of knots are offset by one warp. In this technique the spare warps must float behind the knot, concealing its underneath from view. As a consequence, combination technique tent bands appear to have a plain cotton back. The aq basqur was the largest and most dramatic of these combination technique bands and provided the weaver with a canvas on which to display her complete repertoire of patterns and motifs. 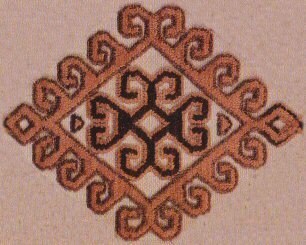 Most patterns are based on horn or mu'yiz-like motifs, but others are distinctly Turkmen and were probably learnt from nearby Turkmen communities. There are two types of aq basqur, one where the decorated sections progress in random order and the second where they are arranged symmetrically so that the same sequence of panels appears on each side of the yurt.